What is Akaneiro: Demon Hunters? 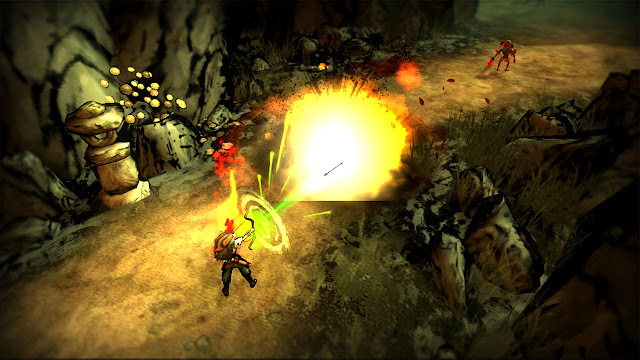 Akaneiro is an Action Role-playing Game with mechanics in the vein of Diablo, Titan Quest and Torchlight. It’s being developed for initial release onPC, Mac, Web, and Android Tablets. Pricing will be announced in the near future. Why make it an ARPG? The “Red Riding Hood hunts in Japan” concept has been floating around the studio for some time. We wanted to experiment with some RPG systems, but not abandon the action game mechanics that had originally been tied to the high concept. So an Action RPG was also the most compatible choice. Also, we like playing them and always wanted to try making one! What does “Akaneiro” mean and why did you choose this name? It’s derived from Japanese language. “Akane” refers to a specific type of plant. “Iro” means color (of). The roots of this plant, called “Madder” in English, can be used to produce a specific hue of red dye. It’s a name heavy with symbolism, too – roots of blood red, a “madder” color could be interpreted as the color of anger. Thus – “Angry Red”. In the game world, Akaneiro is the Japanese name given to a famed demon-hunter believed to have been the actual young girl of the Red Riding Hood tale. She founded the Order of Akane. How exactly does the game reference Red Riding Hood? As mentioned above, the Order of Akane is rumored to have been founded by the “real” Red Riding Hood. The disciplines and beliefs of the Order are built around the three primary human character archetypes featured in the Red Riding Hood – The Red Girl, The Quiet Huntsman and The Forest Mother.Respectively these are based upon Red, The Huntsman and Red’s Mother/Grandmother. What is the Order of Akane? 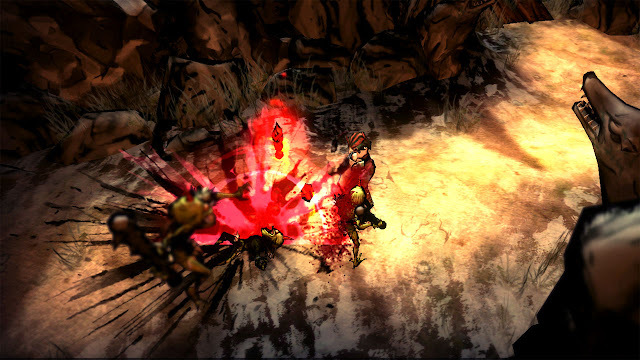 The Order is a templar-like group of demon hunters who fight to maintain the balance between humanity and demon-kind. It fights this battle globally, on many fronts – though our game initially focuses around the Japan-based chapter. Order members are commonly referred to as “Red Hunters”. So who is my character? The player character is a young Red Hunter, dispatched as a scout to ascertain the true threat posed to Yomi Island by the rising Yokai numbers and aggression. If the danger is real, then leave has been given to eliminate the threat by striking at Yokai leaders. What makes these hunters special? 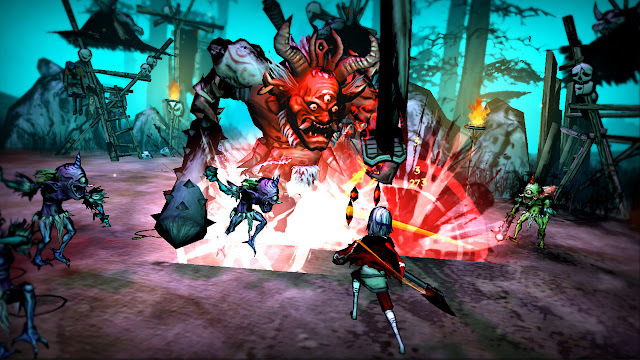 In Akaneiro: Demon Hunters, the Red Hunters fight against Yokai(Japanese folk monsters/demons). The blood of slain Yokai crystallizes, forming glowing red Karma Shards. The power stored within Karma Shards allows Red Hunters to master almost super-human combat techniques necessary when facing Yokai. Apart from this augmented performance, they receive a high level of training intactics, survival and natural magic. So they kill Yokai on sight? Recently, human encroachment and conflict has provoked the more aggressive Yokai. The incidences of violence escalate, and some Yokai have begun to organize and prepare for war under the leadership of powerful Demon Kings. Officially, it is this type of demon threat that the Order is sanctioned to prevent. Do they kill “good” Yokai? There are many Yokai who pose no threat to the balance between humanand demon. On the contrary, some are quite harmless – even helpful. Those that are dangerous often stay far from human settlements. In these cases, the Order will not act against Yokai. There are some dissenting voices within in the Order, however. These splinter groups would prefer to simply exterminate Yokai altogether. Besides traditional Yokai, what other enemies are featured? Some wild animals have become corrupted by demonic influence and very hostile as a result. Later expansions will introduce some human enemies, representing as yet unannounced factions. Where and when is the game set? Our setting is mid to late 19th century Japan. The game takes place on the fictional Yomi Island, north of Hokkaido. Yomi Island is inhabited by a mixture of the indigenous Ainu, Japanese and a whole bunch of angry Yokai. What role do the Ainu people play? We tap into some Ainu mythology, and the totemic aspects of the culture. Several NPCs are Ainu, and we use some specifically Ainu yokai and folklore too. We also try to use some of that motif in the general design of graphic elements and patterns in the UI and world. The Ainu culture has a quite distinct visual presence. It was interesting to explore and integrate it. Why the Japanese setting and influence? While the western high fantasy setting functions perfectly well formost ARPGs, we really wanted to depart from that theme. The folklore of Japan and neighboring regions is rich and inspiring, and we were also able to marry our art style to it. The reason we chose that particular time in Japanese history was that it was when Japan properly re-opened itself to relations and trade with western nations.This was a major culture clash, and inspired great change (not all of it positive). Since we’re introducing some western themes into an eastern setting,it seemed like an appropriate time period. What options do I have at character creation? Though we don’t feature prescribed class paths, a new character must select a base Discipline from Prowess, Fortitude or Cunning. These Disciplines represent the 3 main branches of hunter training within the Order, and determine what base stats, weapon/armor mastery and abilities the character will begin with. After creation you are free to deviate from this path. How does my character grow more powerful? When leveling up, you can place points into base stats which improve abilities, attack power, defense, critical attacks, health, focus, etc. Training in new abilities, weapon and armor mastery opens up new possibilities. Each common enemy killed provides a small amount of experience. Bosses and Rare enemies provide larger amounts. Mission rewards deliver the largest lump sum of experience. Engaging in co-op activity also provides bonus experience. Are there any restrictions on what abilities or equipment my character can use? We don’t apply any class-style dividing lines which prevent your character from learning a given skill or using an item. As long as level and stat requirements are met, you can use it. We want players to experiment and find exactly the right build for personal play style. Furthermore, any armor and weapon item can have any stat applied via our crafting system –so you can look exactly as you prefer without sacrificing power or versatility. Are you a monk with a giant claymore? Perhaps a geisha with dual hand scythes? Go for it – it’s your character, so do it your way. Yes. When you create your second character, you’ll automatically form a squad. Squads share currency, communal stash inventory, mission status, achievements and other unlockables. You can even bring one of your other characters along with you on a mission and share the reward. What are these pets you can summon? Do they fight for you? 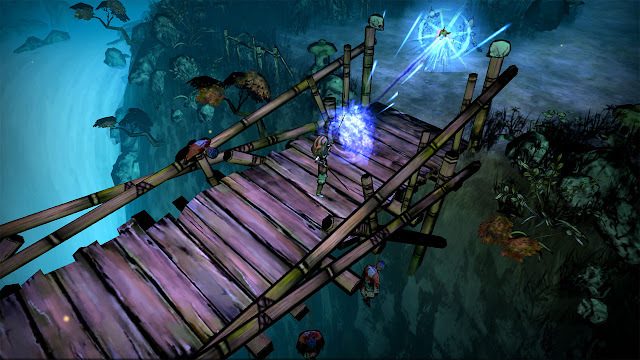 After sailing from mainland Japan, your hunter arrives at Yomi Village – which is under attack by Yokai. After the village is safe, you a free to undertake missions issued by the Order of Akane. What can I do in Yomi Village? You can engage in the usual trade activities, purchase food and drink, upgrade your equipment, review world/mission state and train. There are also special quests provided by the village ghosts who occasionally appear with specific requests. How is the game levels presented? The game world is separated in to Areas. Each Area presents a different environment style, and introduces new enemies. An area contains several missions that must be completed before the following area is unlocked. The initial release will feature 24+ missions over 8 different areas. What areas are included in the first release? Shigemori River – Flowing down from the central mountain ranges of Yomi Island, this river borders a deep pine forest and runs alongside the Temple Highroad. Jawbone Ravine – Craggy ravines cut through forested areas and expose caves and passages that lead to a vast underground lake. Shivering Pines – An unearthly cold has settled over this ancient pine forest, freezing the nearby lake solid. Bloodroot Cemetery – Gnarled roots choke and grasp at clusters of forgotten gravestones and weathered monuments. Yurei Caverns – Underground water has slowly carved out this immense hive of caverns. Many foul things have takenup residence. Bloodfang Fort – Long abandoned, this temple ruin serves as a base for the Bloodfang Werewolf Clan. A large Yokai army is gathering here. Melon Fields – The coastal edge of the forest is home to a small farming community, often besieged by Yokai. Temple Depths – The catacombs that run under the temple adjoin a series of deep caverns. It’s rumored some of these run even deeper into the earth below. What do missions involve, and how do I complete them? Each mission will set your hunter a variety of task objectives that must be completed. Usually this involves a whole lot of demon killing. Missions feature randomized loot and enemy spawning, branching paths and rare spawns. Almost all missions culminate in a boss encounter. You’ll receive an experience and Karma reward on successful mission completion. The amount will depend on the mission itself, and how well you performed during it.You’ll also receive some item based rewards. So what happens if I die or fail a mission? If, for any reason, the mission is failed – you’ll have a chance to continue if you have enough karma shards (earned from killing enemies and selling items). You can also use a revival prayer to resurrect on the spot. Should you be unable or unwilling to continue, you will be whisked magically back to Yomi Village – the potential mission reward would be lost. Within a certain time period, if you repeat the mission that was failed and reach the exact point where your hunter collapsed, you’ll be able to recover a proportion of the mission reward you had abandoned on failure. Are there multiple difficulty settings? Over time, missions and areas will increase in threat. Higher Threat Level means stronger enemies, new bosses, new quests, higher mission reward and better quality items. When a mission is completed, Threat Level will drop. Missions with lower threat yield higher daily income. In addition, special items can be used to directly control the threat in a given area to suit current preference. Will more missions be added later? What effect do my actions have on the world? The overall threat levels of all areas in the world go toward a global “Karmic World Balance”. Depending on the state of this balance, enemies and drops will be modified. We’ll be encouraging experimentation to discover precisely how Karmic World Balance affects the play experience. In addition to this we will have certain global goals that unlock content. All players can work together to contribute toward these. There will be an extensive and ongoing list of “Akane Trials” set by the Order. Completing these yields item and currency rewards. Completing more Trials increases your Hunter Rank; in turn unlocking more challenging goals. Karma Shards are the crystallized blood of fallen demons. Red Hunters use them as a form of currency. In the game they’re used to resupply, upgrade equipment and purchase training. Collecting Karma Shards as they fall from defeated enemies also provides a small amount of instant healing. How do I earn Karma Shards (game currency)? In addition to killing enemies, missions provide large Karma Shard rewards. Equipment and some items can also be sold for or transmuted into Karma Shards. How do I get equipment? Is it randomized? Equipment loot is earned from killing enemies, as per usual. It can also be purchased in the village, though this is primarily to support crafting and upgrading. The best way to get quality loot is to pry it from cold, dead Yokai hands/claws/tentacles. We have a fully randomized loot system in place, which any ARPG enthusiast will find familiar. Each piece of equipment has randomized properties that define the appearance, base stats, enchantments, element and color. All of these can also be customized independently by the player through our crafting system – so you can build the weapon that suits your needs precisely. How many different types of weapon and armor will you feature? Initially we’ll we have 10 different weapon types, each with 10 design variations across 4 different attack styles. There are 30 different armor sets, each with 3 distinct pieces visible on player. From samurai to actor and everything in-between. We’ll continually be expanding this large list. Each of those may feature any combination of the 3 special properties (with varying property levels) when randomly generated. What sort of weapon & armor training is available? Your character can further specialize in specific weapon and armor via mastery training, which unlocks bonus effects associated with that mastery type. 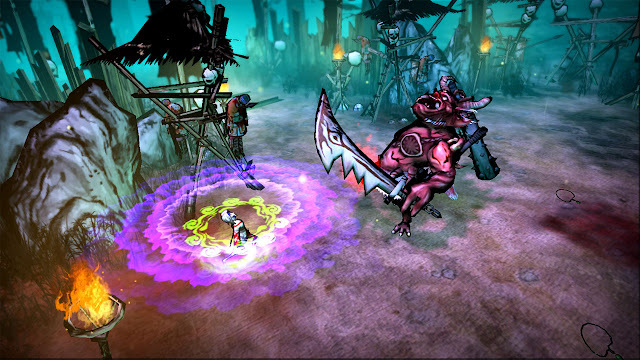 Example: Two-Handed Mastery provides a chance to stun enemies with regular melee attacks. What other items are there? Traditional food and drink items provide passive effects for long durations. Prayer slips help with recovery and survival in deadly situations. Raw materials gathered from enemies or traded can be used to upgrade equipment. 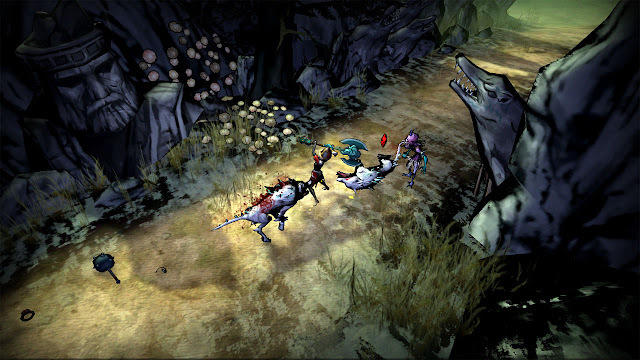 Runes can be used to shift the Karmic World Balance and affect enemy spawns and item drops. Marks provide permanent increases to base stats. How many different enemies arefeatured? We have 8 enemy “families” (species), each with several variant designs including unique bosses. At current count we have over 100 enemy variants. With each new area and mission, this list often grows. Will bosses behave differently than regular enemies? Bosses, rare enemies and some stronger common enemies will feature more advanced combat behavior. They will use offensive and support abilities to augment regular attacks. Elemental attacks are employed by some enemies, too. Expect a more challenging battle when facing these enemies. Yes, we’ll feature co-op; though it’s uncertain what stage of beta it will be available. We’re testing it internally, so the timeframe will depend on issues encountered. As with co-op, we do hope to include it – though the timeframe is less certain.We plan to test it with a smaller selection of beta players first and work closely with the community as we implement it. It’s very important to us that we get it right if and before it’s added. Besides regular multiplayer, how else can players interact? You’ll be able to summon a Spirit Ally – sort of an astral projection of another player’s character to serve as an AI companion during missions. That player will receive a reward in return the next time they start the game. Leaderboards will compare player progress through missions and overall earnings totals as a score, also. We’ll be including some mechanics that foster competition in that regard. Players can also trade items via an in-game mail system. Listening and learning from our closed beta testers! Bugs! New features! Joy! What about tablet controls, are you using virtual stick controls? Absolutely not. We are simplifying some input so your hand doesn’t need to be constantly over the play area during combat, though. We’ll continue to test and adapt, especially when the tablet version is in beta. Does the game look the same on Android tablet? We’ve had the tablet build integrated into our production for some time, and with the support of NVIDIA and the ease of integration via the Unity engine; we’ve not had to sacrifice much at all. We made sure we to save performance where possible and keep the game highly portable. I’d say most players won’t perceive much visual difference on tablet compared to the PC version. When will closed beta test start? Will character/account data be reset during closed beta? Certainly, though we plan to recognize closed beta players with special status and some exclusive items rewards they can take into the final release version of the game. Visually, absolutely – we share the same artistic goal and references. Clover Studio certainly achieved it, and while we’re still applying art polish, we’re flattered by the comparisons. What are your other artistic influences? Beyond videogames (*gasp*), we referenced a long and wide list of Japanese traditional artists and art methods. The Lone Wolf and Cub manga and the art of Kawai Gyokudō have been a particularly strong influence; the former on visual effects and the latter on environment art. Music sounds fantastic, who’s composing it? Our in house master of sound, Kian How, produces SFX and music for all the current Spicy Horse titles. He’s a talented boy- check out his website.